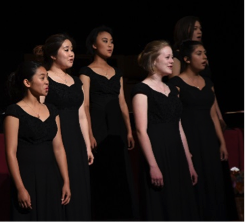 The Advanced Womens’ Ensemble (AWE) travels every other year to beautiful locations across the globe to perform concerts that include masterworks of musical literature. In 2014, Connelly’s award-winning Advanced Womens’ Ensemble, under the direction of Patrick Zubiate, traveled to three countries in central Europe to perform. Highlights included singing at the Chapel in Haus Elisabeth (Vienna, Austria), the Emauzy Monastery (Prague, Czech Republic), and University Church and St. Catherine’s Church (Krakow, Poland). In 2012 the Choir traveled to China.